SAN FRANCISCO — The Hawaii Chamber of Commerce will present its 11th annual Five Star Aloha Gala on Wednesday, May 29, from 5 to 8:30 p.m. in the Alexandria Room at the historic Westin St. Francis Hotel, 335 Powell St., San Francisco. This is the organization’s signature event, and serves as a venue for honoring individuals and organizations with the Kūlia I Ka Nu‘u Award for their contributions in promoting the aloha spirit throughout Northern California and beyond. The 2013 Kūlia I Ka Nu‘u Award to Chef Alan Wong. 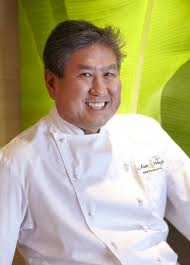 His restaurant, the eponymously named Alan Wong’s, has consistently been ranked in the top 50 restaurants in America by Gourmet Magazine. Wong is a tireless promoter of sustainable island agriculture and one of the founders of Hawaii Regional Cuisine. A true innovator, his passion for the cultural and natural richness of the Hawaiian Islands has helped put Hawaii Regional Cuisine on the map as one of the most highly regarded in the world. The award is for his commitment to the culture and community of Hawaii, and showing that a small island state can produce world-class cuisine in reliance on local sustainable produce. Introducing Wong and presenting him with the award will be Kurt Osaki, a founding member of HCCNC and owner of Osaki Creative Group, a brand development company in Berkeley and Honolulu. Osaki is also partners with Hukilau and Pagoda restaurants. The emcee will be Rick Quan, who was a sportscaster at KITV in Honolulu before spending 20 years at CBS 5 in San Francisco. He is now a part-time sportscaster at ABC 7. Traditional and contemporary Hawaiian singing, music and dance will be performed by Faith Ako, Steven Espaniola, Mike Dayao and Na Lei Hulu I Ka Wekiu, led by Patrick Makuakane. Proceeds from the event will benefit the Kūlia I Ka Nu‘u Scholarship Program. Each year, the HCCNC Foundation grants scholarships to deserving students from Hawaii pursuing their college education in Northern California. The goal is to help develop the 50th state’s future leaders and to further strengthen the bridges between Hawaii and Northern California. To add to the excitement of the Five Star Gala, here are some updates: (1) Major new silent auction prize: Hawaiian Airlines mileage for two round-trip tickets from U.S. Mainland (any airport that Hawaiian Airlines flies from) to New Zealand with free stopover in Honolulu; (2) Grand raffle prize: Two Southwest Airlines round-trip tickets within continental U.S.; no restrictions, no blackout dates; (3) Grand silent auction prize: Hawaiian Airlines mileage for two Hawaiian Airlines round-trip tickets from U.S. Mainland to Hawaii plus one week stay at Ala Moana Hotel. For more information, visit http://hccnc1.ning.com/. Tickets can no longer be purchased online but will be available for purchase at the door.